Using Lantronix supplied Com Port Redirector software, Windows device applications not designed for network communications are re-directed to communicate to devices connected to the UDS1100. Connecting two UDS1100 device servers configured to automatically talk to each other over the network creates virtual serial connections that can extend serial communications across a facility or around the world. The built-in web server enables users to access and configure the UDS1100 from a standard web browser. 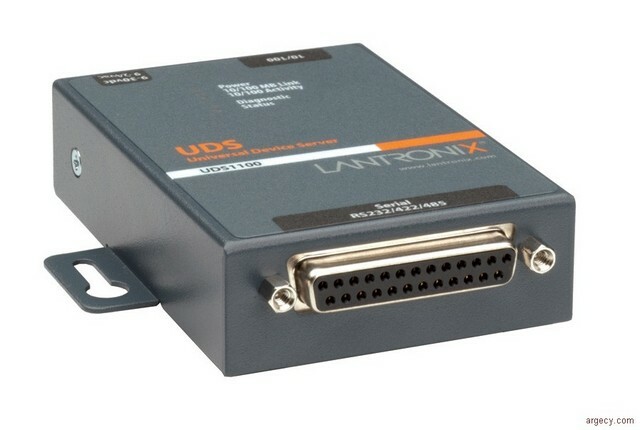 Web pages enabling the UDS1100 to be customized for unique applications can be built using Lantronix development tools. On-board Flash memory provides room for future system software upgrades and maintenance-free, non-volatile web page storage. In modem emulation mode, the UDS is used to replace dial-up modems. The unit accepts modem AT commands on the serial port. It then establishes a network connection to the end device, leveraging network connections and bandwidth to eliminate dedicated modems and phone lines. The PoE version enables you to also take advantage of network connectivity in areas without power outlets. Built into the included Com Port Redirector software, TruPort technology enables Windows-based applications to access and control serial ports on the UDS1100 as if they were actually local PC serial ports. The application can monitor and set hardware pins on the UDS1100 serial ports as well as access serial buffers for total Com port control. This allows existing applications to seamlessly transition from controlling local devices to true remote monitoring and control of devices around the world. For a board-level version of this product, see the UDS1100-B.